The Morgan Motor Company is a British motor car manufacturer that was founded in 1910 by Henry Frederick Stanley Morgan. Morgan is based in Malvern Link, an area of Malvern, Worcestershire, and employs 177 people. Morgan has stated that they produce 850 cars per year, all assembled by hand. The waiting list for a car is approximately six months, and has sometimes been as long as ten years. Morgan cars are unusual because wood has been used in their construction for a century, and is still used in the 21st century for framing the body shell. A visitor centre and museum have exhibits about the company's history from Edwardian times until the present day, developments in automobile technology, and a display of automobiles. There are also guided tours of the factory. H.F.S. Morgan quit the Great Western Railway in 1904 and co-founded a motor sales and servicing garage in Malvern Link. In 1909 he designed and built a car for his own use. He began production a year later and the company prospered. Morgan continued to run it until he died at age 77 in 1959. Peter Morgan, son of HFS, ran the company until a few years before his death in 2003. He was replaced as chairman by Alan Garnett, a non-family director, from 2003 to 2006. After Garnett's resignation, a four-man management team was set up. Charles Morgan, son of Peter, Matthew Parkin, Tim Whitworth, Steve Morris made up the new management team, and in 2010, after Parkin's resignation, Charles Morgan was named managing director. In January, 2013, Morgan was removed as managing director, replaced by Morris, but continued as strategy director until October 2013 when he was removed both as an employee and member of the board of directors. At the end of 2013, the shareholders appointed Andrew Duncan, a local solicitor, as chairman. In 2016, he resigned as chairman and company director and was replaced as chairman by a new director, Dominic Riley. A press release dated 5 March 2019 announced the acquisition of a majority stake in Morgan Motor Company Ltd by the Italian investment group Investindustrial. Details of the transaction, which the parties anticipated would be completed during April 2019, remained "confidential". 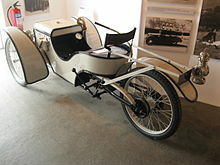 The early cars were two-seat or four-seat three-wheelers, and are therefore considered to be cyclecars. Three-wheeled vehicles avoided the British tax on cars by being classified as motorcycles. Competition from small cars like the Austin 7 and the original Morris Minor, with comparable economy and price and better comfort, made cyclecars less attractive. H.F.S. Morgan's first car design was a single-seat three-wheeled runabout, which was fabricated for his personal use in 1908, with help from William Stephenson-Peach, the father of friends, and the engineering master at Malvern College. Powered by a 7 hp (5.2 kW; 7.1 PS) Peugeot twin cylinder engine (from an abandoned motorcycle project), the car had a backbone chassis, an idea retained for all following Morgan three-wheelers, and used as little material and labour as Morgan could manage. A single-seat three-wheeler with coil-spring independent front suspension, unusual at the time, the driveshaft ran through the backbone tube to a two-speed transmission (with no reverse), and chain drive to each of the rear wheels. The steering was by tiller, and it had band brakes. It also had no body. With financial help from his father and his wife, the car was put into production at premises in Pickersleigh Road, Malvern Link. Three single-seater cars were exhibited at the 1910 Motor Show at Olympia in London. In spite of great interest being shown, only a few orders were taken, and Morgan decided a two-seater was needed to meet market demand. This was built in 1911, adding a bonnet, windscreen, wheel steering, and crank starting; it was displayed at the 1911 Motor Cycle Show. An agency was taken up by the Harrod's department store in London, with a selling price of £65. The Morgan became the only car ever to appear in a shop window at Harrods. Interest in his runabout led him to patent his design and begin production. While he initially showed single-seat and two-seat versions of his runabout at the 1911 Olympia Motor Exhibition, he was convinced at the exhibition that there would be greater demand for a two-seat model. The Morgan Motor Company was registered as a limited private company only in 1912 with H.F.S. Morgan as managing director and his father, who had invested in his son's business, as its first chairman. In 1912, Morgan set out to win the trophy offered by The Light Car & Cyclecar for greatest distance covered in an hour, at Brooklands. The single-seater covered 55 mi (89 km), only to be narrowly beaten by a GWK; Morgan returned later the same year, reaching nearly 60 mi (97 km). Morgan established its reputation via competition such as winning the 1913 Cyclecar Grand Prix at Amiens in France, driven by W. G. McMinnies, with an average speed of 42 mph (68 km/h) for the 163 mi (262 km) distance. This became the basis for the 'Grand Prix' model of 1913 to 1926, from which evolved the 'Aero', and 'Sports' models. Morgan himself won the "very tough" ACU Six Days' Trial in 1913, in the sidecar class. The same year, the company entered the MCC reliability trial, which it continued to do until 1975. Racing success led to demand the company proved unable to meet. After the First World War, the company introduced an easily changed rear wheel, which customers had been seeking for several years. The 1921 Popular, powered by an 8 hp (6.0 kW; 8.1 PS) JAP and bodied in poplar, sold for £150. It was a sales success, the price dropping to £128, and the name changing to Standard, by 1923, when a Blackburne engine was also available. The Grand Prix was priced £155, and the Family (with two notional child seats behind the front bench, setting a standard 2+2s would follow for generations) was £148 with air-cooled engine, or £158 with water-cooled engine. The Anzani-powered Aero was also available, for £148. MAG engines were also optional. Morgan's racing efforts suffered a blow in 1924, when E. B. Ware's JAP-engined car rolled at the JCC 200 mi (320 km) at Brooklands; Ware was seriously hurt, leading to a ban on three-wheelers competing as cars. Electric headlamps were made available in 1924, at an £8 cost. The Popular, powered by a 976 cc (59.6 cu in) engine, sold for £110, the 1,098 cc (67 cu in) Aero for £148, and the one-seater £160. Like motorcycles, Morgans had hand throttles, Bowden-wire control mechanisms, and drip lubrication. Racing Morgans included Harold Beart's 1,096 cc (66.9 cu in) Blackburne-engined special, with 3.33:1 top gear and a 43 lb (20 kg) streamlined body, which covered 91.48 mi (147.22 km) in a one-hour trial at Brooklands, with a peak speed of over 100 mph (160 km/h). In 1925, the Standard's price had dropped to £95, and the Aero £130, compared to £149 for an Austin Chummy. Electric lighting by dynamo became standard that year. 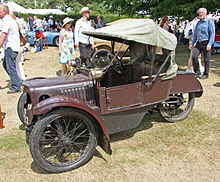 Front-wheel brakes and electric start (a £10 option) became available in 1927, while the Standard's price fell to £89, complete with a double-thickness windscreen and "electric hooter". By year's end, the Standard was even cheaper, £85, while the new Super Sports debuted, with an overhead valve JAP 10/40 water-cooled vee-twin, priced £155. The 10/40 engine was also available in the Aero, at £132, while a more sedate air-cooled JAP-powered Aero went for £119. The Family was priced at £102 (air-cooled) or £112 (water-cooled). These new, lower prices persisted through 1928. They would be lower still in 1929: the Standard and Family at £87 10s, the Aero £110, and the Super Sports £145. In 1933, the Family was priced at only £80. Morgan's racing program in 1927 earned the marque eleven gold medals and three silvers from fourteen entrants at MCC's London-Edinburgh Trials alone. The team was joined by Clive Lones and C. T. Jay, who won the 1929 Cyclecar Grand Prix at Brooklands, driving a 750 cc (46 cu in) Morgan-JAP, with an average speed of 64.7 mph (104.1 km/h). And in 1930, Gwenda Stewart turned in a speed of 113 mph (182 km/h) in a race-tuned Super Sports. Morgan three-wheelers benefitted from an annual tax of just £4, half the tax on the Austin 7, provided they remained under 8 cwt. 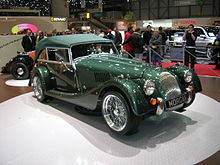 Morgans were also licence-built in France by Darmont. By 1930, however, inexpensive four-wheeled cars were proliferating, led by the £100 Ford Popular. Morgan, and partner George Goodall, countered by putting the 8 hp (6.0 kW; 8.1 PS) 933 cc (56.9 cu in) and 10 hp (7.5 kW; 10 PS) 1,172 cc (71.5 cu in) Ford engine in their own cars. Morgan's last vee-twins were powered by Matchless engines displacing 990 cc (60 cu in); they were delivered to Australia after the Second World War. The vee-twin models were not returned to production after World War II. The Morgan Club re-formed in 1927. Morgan's first four-wheeler, named the 4–4 because it had a four-cylinder engine and four wheels, was released to the public in 1936. Powered by a 34 hp (25 kW; 34 PS) 1,122 cc (68.5 cu in) Coventry Climax engine, and carrying a pair of rear-mounted spare wheels, the new two-seater 4–4 sold for 185 guineas (£194 5s). It proved popular, and a four-place model was added in 1937, joined by a £236 drophead in 1938. Coventry Climax eventually ceased making engines available, so Morgan switched to a tuned 1,267 cc (77.3 cu in) Standard Motor Company Ten, producing 39 hp (29 kW; 40 PS). In 1938, a 4–4 was entered at Le Mans. This led to production of factory replicas, with fold-down windscreen, cycle fenders, smaller-displacement engine, and single spare wheels, with a price of £250. The Morgan +4 was introduced in 1950 as a larger-engined ("plus") car than the 4/4. The +4 initially used the 2,088 cc (127.4 cu in) Standard Vanguard engine and at introduction sold for £625 (two-seater) or £723 (coupé). The +4 used Triumph TR2 (in 1953), TR3 (1956), or TR4A engines (until 1969). Plus 4 production was suspended in 1969 but brought back in 1985 with a Fiat engine (1985–1988) and then a 4-cylinder Rover engine (1988–2000). Production was again suspended and the Plus 4 returned once more in 2004 with a 155 bhp (116 kW; 157 PS) Ford 4-cylinder. From October 1965 to April 1967 Morgan produced the two-seat +4 Competition, of which only 42 were built, about 11 of which survive. A limited edition Plus 4 was re-introduced in 2014 as the Plus 4 Super Sports. Only 60 cars were made available, all right-hand-drive. A version of the +4, the +4+, was made from 1964 to 1967 with a fibreglass coupé body. The light weight and reduced drag improved the performance of the +4+ over the standard +4 in every aspect. However, traditional Morgan enthusiasts did not embrace this departure from Morgan custom, and mainstream enthusiasts did not embrace the seemingly archaic +4 chassis. Fifty were planned, but only 26 were built. Production of the 4-4 was halted during World War II but resumed afterwards as the 4/4. Production halted again in 1950 when the Standard engine ceased to be available, but resumed in 1955 when a suitable replacement, the side-valve 1,172 cc Ford 100E engine was found, and has continued ever since. The 4/4 now uses the +8 chassis and a Ford engine. Faced with the decreasing availability of large four-cylinder engines for use in their +4 models, Morgan began to install the recently available Rover V8 engine in their cars in 1968, giving these cars the model designation "+8". The engine displacement jumped from the 2.3 L of the Triumph TR4 engine to 3.5 L, then 3.9 L (1990), 4.0 (1998–2004) with an optional 4.6L (1996–2000) all based on the same Land Rover block. However, the V-8 was no longer than the Triumph. These features made the +8 accelerate much more quickly than the early +4 and also improved its road-holding capability. Horsepower (143–204 bhp), weight and performance varied with emission and structural laws through its history. In its final form, the GEMS Land Rover V8 produced 190 hp (140 kW). Thus powered, the car could accelerate from 0–60 mph in 5.6 seconds. In 2004, Morgan came out with a traditional styled model to replace the departing Plus 8. The Mk I Roadsters with the Ford UK Mondeo V6 produced 223 bhp (166 kW, 226 PS) at 6150 rev/min. It had a Getrag gearbox with direct drive in 5th with a 3.08 axle ratio. Later Marks had a Ford gearbox with direct drive in 4th with a 3.73 axle ratio. The overall gearing is virtually the same. The later Roadsters were powered by a Ford UK Mondeo V6 producing 204 bhp (152 kW; 207 PS). In 2007, the Mondeo engine was replaced by a US-specification version of the same engine in the Roadster II. In 2011–12, the engine was replaced by the 3.7 Duratec Cyclone engine and output increased to 280 bhp (209 kW; 284 PS). The company calls this latest model the Roadster 3.7. In 2000, the Morgan Aero 8 was introduced and, as always, the wooden body substructure was ash. (Contrary to popular myth, however, the chassis is metal; aluminium for the Aero 8.) The Aero 8, with a BMW V8 engine in a car weighing less than a BMW Z4 and considerably less than a BMW M3, (though more than traditional Morgans) is even faster than the Plus 8, delivering what Autoweek magazine termed supercar performance. The newest Aero 8 (series V), presented in March 2015, puts out 367 hp (274 kW) at 6100 rpm with the company suggesting a top speed of over 170 mph (270 km/h). Due to the Aero 8's light weight it can do 0–62 mph (100 km/h) in 4.5 seconds. During its customer production lifetime (2002–2009), the Aero was configured in five official versions, (I, II, III, IV, the Aero America and V) with mild variations in styling, engines, transmissions, braking and suspension. The company canceled the model in 2009 but relaunched it in 2015 for 2016 deliveries. The year of highest production for any Aero variation was 2002. The Aero was followed by the Aeromax, a limited edition of 100 units produced between 2008 and early 2010. The Aeromax was a coupé variation of the Aero 8. Customers have included Richard Hammond, Rowan Atkinson and Paul O'Grady. The Morgan Aero SuperSports is a targa-roofed version of the AeroMax, sharing its bonded aluminium chassis and lower bodywork with the coupe. It was launched at the 2009 Pebble Beach car show in California. Its cancellation was announced in March 2015. The Morgan Aero Coupé is a hard top version of the Aero SuperSports, sharing its bonded aluminium chassis, bodywork, suspension and engine. It was launched at the end of 2011. It is not available in the United States. Its cancellation was announced in March 2015. The new Morgan Plus 8 is a classic body version of the Aero SuperSports and Aero Coupé, sharing their bonded aluminium chassis, bodywork, suspension and engine. It was launched at the end of 2011. It is not available in the United States. The Morgan Plus E is an electric version of a classical Morgan, a joint project of Morgan with Zytek and Radshape (Radshape Sheet Metal Ltd.), funded by the UK government. It was displayed at the 2012 Geneva Motor Show. Based on the same chassis as the Aero Supersports, the Eva GT would have been a 2+2 grand tourer, and as such it would be longer in the body. The Eva GT would use BMW N54 twin-turbo straight-6 producing 302 bhp, Euro-6 emissions compliant. Shown at Pebble Beach in clay in 2010 and expected to go on sale in 2012, deposits have been taken since 2010. At the end of 2011, Morgan announced that it would use new magnesium technology for the body and therefore it would not be represented until 2014 with deliveries after that. In 2013 dealers confirmed that the EvaGT had been cancelled. The Morgan Motor Company announced that they would launch the "3 Wheeler" in 2011at the Geneva Motor Show. The 3 Wheeler was initially said to have a Harley-Davidson Screaming Eagle V-twin engine and a Mazda 5-speed manual transmission, and was estimated to deliver 115 hp (86 kW) at the rear wheel. However, the prototype that was shown at Geneva had an S&S engine. Production three-wheelers turned out to have S&S engines. The kerb weight was originally estimated to be less than 500 kg (1,102 lb), but the final weight was tested at 550 kg (1,213 lb). The acceleration from zero to 60 mph (97 km/h) was estimated by Morgan as 4.5 seconds, with an (estimated) top speed of 115 mph (185 km/h). The three-wheeler is to be homologated as a motorcycle in the United States. The company states that 850 deposits have been taken since the announcement in 2011. Customer deliveries began in Europe in February 2012. US deliveries were not expected before June 2012, when the first imported three-wheeler was displayed in New York City and at the Greenwich Concours d'Elegance. The Morgan 3 Wheeler was featured in a Series 18 episode of UK motoring show Top Gear where presenter Richard Hammond selected the Morgan 3 Wheeler in a comparison of track-day cars. The 3 Wheeler won the "Not-A-Car of the Year 2011" in Top Gear magazine. For part of the 1950s and 1960s, the United States provided the company with its largest market worldwide, taking up to 85% of all production. This ended with the first wave of US safety and emission regulations in 1971. For many years (1974 to 1992), all Morgans imported into the United States were converted to run on propane as fuel to pass the US emissions regulations. However, this conversion, along with bringing the cars into compliance with US vehicle safety legislation, was carried out by the dealership, and not by the factory, making the cars grey market vehicles. However, when the Rover Group re-certified their V8 engine for use in the Range Rover 4x4 sold in the US, Morgan was able to use the same engine for a fully US-compliant stock Morgan from 1992 to 1996, and again from 1998 to 2004. In 2005, the engine was replaced with the US-version of another traditionally shaped model (with a V6), called the Roadster. In 2002, Morgan centralised its international compliancy development and regulatory interaction in-house. In 2005, its right to import its classic models ceased when supplies of its necessary airbag were exhausted and no replacement was developed. 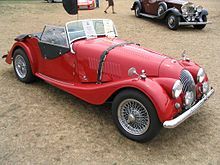 In 2006, a request for an airbag exemption to the US National Highway Traffic Safety Administration was refused, and the import of classic Morgans ceased. In 2005, the new Morgan Aero 8 model (versions 2 and 3) received a three-year exemption from rear impact non-compliance, along with a separate exemption for compliance with "advanced airbag requirements". The rear-impact exemption lapsed in May 2008 without further application. Morgan has indicated to its US dealers that it plans to re-apply for US certification for some model at as yet an undetermined date in the future. In April 2012, the new Morgan 3 Wheeler was show-cased at the New York International Auto Show, at the Jacob Javits Center, by Bobby Singh and Gideon Lang-Laddie of Manhattan Motorsports. This was the first time in 10 years that Morgan had had a presence at the largest of the American car shows and was the first US specification Morgan 3 Wheeler in the United States. 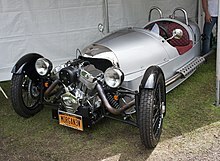 The Morgan 3 Wheeler was voted one of the "Hottest Cars Of The Show" by G4TV. In May 2012, Manhattan Motorsports took delivery of Charles Morgan's Superdry edition Morgan 3 Wheeler and prepared it for its first major American trial. This vehicle was driven across the States, from New York to Los Angeles by Charles Morgan and his wife, covering 3000 miles, in the Gumball 3000. At the end of the seven-day drive, the Morgan 3 Wheeler was awarded the "Spirit of Gumball" prize. In spite of their traditional design, Morgans have always had sporting or "sports car" performance, due to their extremely low weight. Among their enthusiasts, Morgans are affectionately known as "Moggies". H.F.S. Morgan's 1909 Runabout used sliding pillar suspension, an independent front suspension system with each front wheel mounted on a stub axle able to slide up and down a fixed pillar that also acts as the kingpin and supported by a spring and external shock absorber (damper). One advantage is reduced unsprung weight, theoretically allowing the tyre and wheel to better respond to road surface irregularities. The Morgan system is described as an 'inverted' sliding pillar, as the pillar is fixed and the hub carrier slides over it. Earlier systems had the wheel carried on the pillar, sliding through a bush on the axle. Morgan used developments of this suspension system throughout its existence, and it is still used on Morgan's "classic" line, although not on the Aero 8 or its derivatives. Morgan cars can be found in many areas of motorsport, from club and historic racing to more prominent examples, including the Le Mans 24hr race. A notable Morgan racecar was the Aero 8 GT car that campaigned in 2008 Britcar races and the 2008 Britcar 24hrs at Silverstone, prepared and run by Mark Bailey Racing. Pescarolo Sport rebranded its Le Mans Prototype as a Morgan for the 2012 24 Hours of Le Mans, partly to mark the 50th anniversary of a class victory for a Morgan Plus Four Super Sports at Le Mans. Sir John Harvey Jones famously visited the firm in the 1990s BBC documentary series Troubleshooter in which he advised the firm to modernize. The company rejected the advice but made other changes to its processes. ^ "About Us". Morgan Motor Company. 2019. Retrieved 5 March 2019. ^ "Let the Wood (and Aluminum) Times Roll: A Tour of Morgan Motor Company's Factory". Retrieved 4 January 2018. ^ a b Hastings, Harold (30 May 1970). "Sixty years old and thriving". Motor: 28–31. ^ Ping Chan, Szu (18 October 2013). "Charles Morgan describes distress at being ousted from board role". Daily Telegraph. London. Retrieved 12 November 2013. ^ "Charles Morgan removed from world-famous UK car firm". BBC. 31 October 2013. Retrieved 12 November 2013. ^ Massy, Ray (17 October 2013). "Historic British sports car maker Morgan faces backlash after ousting the founder's final family member from the board". Daily Mail. London. Retrieved 12 November 2013. ^ "Investindustrial acquired majority stake in Morgan Motor Company" (PDF) (Press release). Investindustrial Advisors Limited, London. 5 March 2019. ^ Bowen, Gregory Houston; Morgan Charles (2008). Morgan 100 Years. London: Michael O'Mara. ISBN 978-1-84317-267-3. ^ Boddy, William. "Morgan: An Ageless Thoroughbred", in Ward, Ian, Executive Editor. The World of Automobiles, Volume 12 (London: Orbis, 1974), p.1410. ^ a b c Boddy, p.1410. ^ a b c d e f g h i j Boddy, p.1411. ^ "How The Morgan Began". Morgan3w.de. 29 July 1952. Archived from the original on 2 March 2012. Retrieved 17 September 2011. 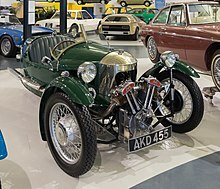 ^ a b c "The Morgan Three-wheeler Models". Morgan3w.de. Archived from the original on 3 December 2012. Retrieved 17 September 2011. ^ "Engines used in the Morgan Three-wheeler". Morgan3w.de. Archived from the original on 8 April 2012. Retrieved 17 September 2011. ^ a b "– Technical Details of the Morgan Three-wheelers". Morgan3w.de. Archived from the original on 10 July 2012. Retrieved 17 September 2011. ^ a b c d e f Boddy, p.1412. ^ a b c Boddy, p.1413. ^ a b c d e f g h i j Boddy, p.1414. ^ a b c d e f Boddy, p.1415. ^ a b c d e f g Boddy, p.1417. ^ a b Boddy, p.1418. 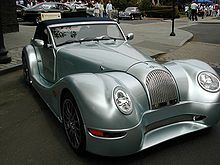 ^ "2006 Morgan Aeromax". Seriouswheels.com. Retrieved 17 September 2011. ^ "Morgan Aero 8 Review (2017) – Autocar". www.autocar.co.uk. Retrieved 16 July 2017. ^ "Morgan Plus E Electric Roadster: Modern Battery In Classic Car". Retrieved 16 July 2017. ^ a b c d e f "2011 Morgan Threewheeler". Edmunds Inside Line. Edmunds Inc. 4 November 2010. Retrieved 19 February 2011. ^ a b c d e Harrison, Sarah-Jayne (3 November 2010). "Morgan 3 Wheeler (2011) first official pictures". Car Magazine. Peterborough, Cambridgeshire, UK: Bauer Media. Retrieved 19 February 2011. ^ a b c d e f Phillips, Tom (4 November 2010). "Morgan revives the Threewheeler". Auto Express. London: Dennis Publishing. Retrieved 19 February 2011. ^ a b c d e Constant, Brad (11 March 2010). "Morgan Threewheeler returns after 58-year break". Autoweek. Detroit: Crain Communications. Retrieved 19 February 2011. ^ "Morgan 3 Wheeler car review – TopGearhk". www.topgearhk. Retrieved 29 March 2019. ^ a b c d e f Miersma, Seyth (3 November 2010). "First Look: 2011 Morgan Threewheeler". Winding Road. Ypsilanti, Michigan, US. Retrieved 19 February 2011. ^ Garrett, Jerry (25 February 2011). "Geneva Auto Show: Morgan 3 Wheeler". The New York Times. Retrieved 4 March 2011. It was announced to have an 81-horsepower V-twin motorcycle engine built by S & S, the same company that builds motors for so-called Harley clone choppers, and is closely based on late-model Harley-Davidson power plants. However, the UK test the final bhp at 81 bhp. ^ Berkowitz, Justin (March 2011). "Morgan 3-Wheeler – Auto Shows". Car and Driver. Hachette Filipacchi Media U.S. Archived from the original on 4 March 2011. Retrieved 4 March 2011. This S&S-supplied powerplant is a bit more modern, though: It produces 81 hp, is fuel-injected, and is mated to a Mazda-sourced five-speed gearbox. ^ Laban, Brian. Morgan: First and Last of the Real Sports Cars. London: Virgin Books, 2000, page number not cited. ^ "Reprint of Car & Driver article, January 1977". Morgancars-usa.com. Retrieved 17 September 2011. ^ Hardiman, Paul. "The New Morgan Three Wheeler". Hagerty.com. Retrieved 1 March 2014. ^ "EV3". Retrieved 4 January 2018. ^ "British Sportscar Maker Morgan to Race LMP2 Car at Le Mans". motortrend.com. 23 January 2012. Retrieved 4 March 2012. ^ "How the troubleshooter's firms fared". BBC. 11 January 2008. Retrieved 13 October 2011. Wikimedia Commons has media related to Morgan Motor Company.